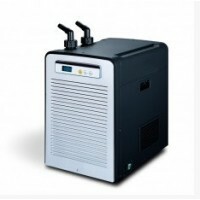 The New CSXC-1 is an easy to use small format chiller unit that has a very accurate digital touch-pad LED display (to 0.1 degree). 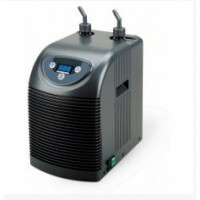 Undesirable heat builds up quickly in any aquarium with the addition of powerheads, pumps, high-intensity lighting, UV sterilizers, etc all add up into the aquarium. 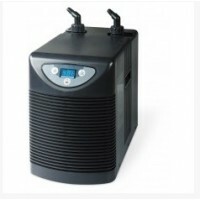 The CSXC-1 chiller is perfect for any aquarium up to 30 gallons (depending on heat input). This also works wonders any hydroponics setup. This unit incorporates the same thermoelectric technology used by NASA to generate electricity and maintain equipment temperature in space! *The values shown above are guidelines only. Actual values depend on individual tank specifications, insulation, equipment used, environmental conditions, etc.